After the First Friday organ recital by Gary Sieling, we had some furniture shifting to do to prepare for the Christmas Fayre on Stony Stratford Lights Switch-on day. Soon the tables had been put in place and Kath supervised the arrangement of the hampers and prizes for the Golden Spot Tombola. Nina, Kath, Marilyn and Eilish had done a wonderful job of getting donations to go in the hampers and the display was impressive. Sylvia, its founder, would have been proud. 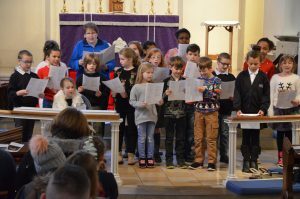 On Saturday morning the doors of the church were opened to welcome a stream of children and parents who came for the first musical performance of the day - Russell Street school children singing Christmas songs. 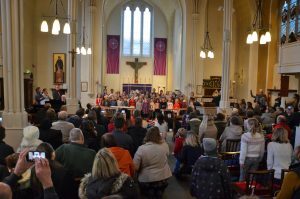 Even the galleries were filled with parents and friends encouraging the children who wore a variety of Christmas or winter themed jumpers as they sang. 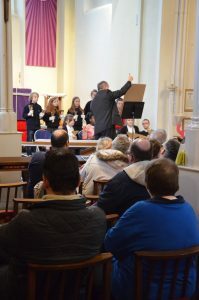 They were followed by St Mary & St Giles school children who played handbells and sang. 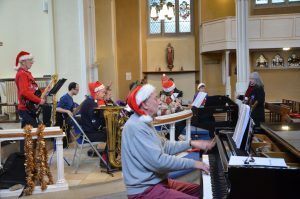 After the children had finished performing the church band set up and played music for Advent and Christmas songs for the afternoon. In the hall Hazel and the team of volunteers were kept busy all day as they had a steady stream of people wanting soup, sausage rolls, mince pies and cakes with their tea or coffee as it was cold and later a bit damp outside. All the stalls benefitted from the crowds through the day, the craft stall did well, there were books and bric a brac as well. The Traidcraft and Kidney Research stalls had plenty of interest too. A relay of people ran the Grand Draw for the greater access fund near the west door. Even when the lantern procession was proceeding around the outside of the church and the Stony Stratford lights were switched on after dark people were still coming into the church for warmth, refreshments and the last of the Golden Spot tombola prizes. 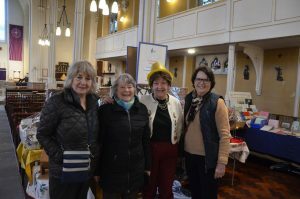 We were very pleased that once again the Golden Spot Tombola did so well as we raised £794 for the organ maintenance fund - thank you to everyone who helped run the stall or donated prizes. 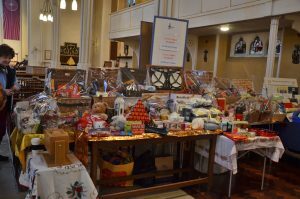 You can see more photos of the Christmas Fayre in SMSG church in the album SMSG Christmas Fayre 2017.